Pressbooks creates three main book formats: print books, ebooks, and webbooks. Each format has its own default way of paginating text. In a print book, pages flow according to how much text you have divided by the size of the page you’ve chosen. Ebooks are generally paginated too, though the flow of the text is more dependent on what device and platform a reader is using to view your book. 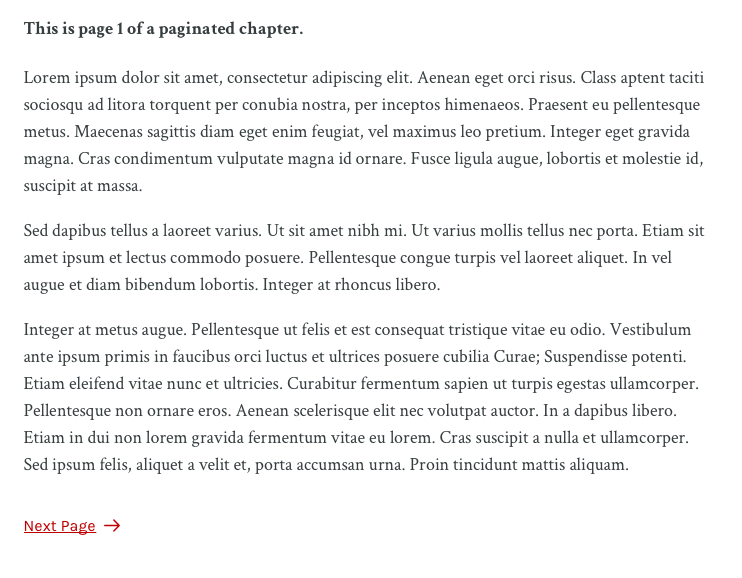 For Pressbooks webbooks, the default pagination setting is that each chapter takes one webpage. However, if you’d like the reading experience and structure of your webbook to be more similar to more traditional book formats, you can manually paginate each chapter of your webbook. When you paginate a chapter, readers will navigate between pages with the “Next Page →” and “← Previous Page” icons that display directly below page’s content. These navigation controls are independent of the chapter navigation; users can navigate with either at any time. Note that paginating your webbook should have no effect on your other book formats; ebooks and print books created from the same source as a paginated webbook will paginate the way they normally do.